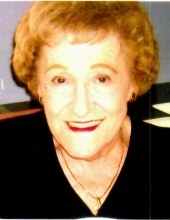 Beverly - Ann (Angelini) Pellegrini 98, beloved wife of the late Gene Pellegrini, died Saturday, February 2, 2019 at the Beverly Hospital. Born and raised in Beverly, she was the daughter of the late John and Rose (Tourani) Angelini. She received her education in the Beverly school system and graduated from Beverly High School. A lifelong resident of Beverly before moving to Danvers, Mrs. Pellegrini dedicated her life to raising her family. As a young woman, she volunteered with the Girl Scouts. She enjoyed gardening, knitting, cooking and entertaining. Ann was a loving mother, grandmother, great grandmother and friend who will be missed by all who knew her. She is survived by her daughter, Linda Galloway and her husband, John of Peabody, her son, David Pellegrini of Beverly, a granddaughter, Julie Kable and her husband, Joseph of Georgetown, a great grandson, Joseph Kable and several nieces and nephews. She was predeceased by six sisters and three brothers. ARRANGEMENTS: Her funeral service will be held in the Campbell Funeral Home, 525 Cabot Street, Beverly, Thursday, February 7, 2019 at 10:00 a.m. Relatives and friends are invited to attend. Visiting hours on Wednesday from 5 to 7 p.m. Burial in St. Mary’s Cemetery, Beverly. Contributions may be made in her memory to Autism Speaks, 1 East 33rd St., 4th Fl., New York, NY 10016. Information, directions, condolences at www.campbellfuneral.com . To send flowers or a remembrance gift to the family of Ann Pellegrini, please visit our Tribute Store. "Email Address" would like to share the life celebration of Ann Pellegrini. Click on the "link" to go to share a favorite memory or leave a condolence message for the family.